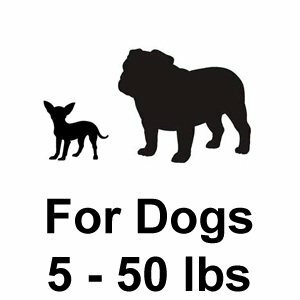 The PetSafe Elite Little Dog Fence is designed for the little guys, particularly those under 12 lbs. with neck sizes of 6-16”. The collar that comes with this system is the smallest in the industry and weighs in at only 2 ounces (2.7 oz with battery installed), so its much more comfortable for a small dog. Along with the reduced size, the correction level has been lowered in the Elite Little Dog collar to make it more appropriate for smaller dogs. It is the choice option for multi-dog households with small and large dogs because the Elite LIttle Dog fence system is compatible with other PetSafe collars. Since the correction level is adjusted on each individual collar, you can set the correction at the appropriate level for each of your dogs regardless of size. The collar battery is proprietary so have a few on hand because you can't just run to the local convenience store to grab a generic if your collar is drained. Smallest Collar: Weighing just 2 ounces, the Elite Little Dog receiver collar is the smallest, lightest collar available. Designed specifically for small dogs, this is about the only collar suitable for dogs as small as 5 lbs. Compatible With Indoor Pet Barrier: The PetSafe Elite Little Dog collar is compatible with PetSafe Indoor Radio Fence (PIRF-100), so you can easily keep your dog off certain furniture or out of specific areas of the house. Individual Correction Levels: The correction level control is on the PetSafe Elite Little Dog collar itself, so each collar on the system can have it's own correction level setting. This makes the Elite Little Dog perfect for multi-dog homes where dogs are of varying sizes. Only Standard Contact Points: The Elite Little Dog comes with standard length contact points. Standard length contacts are fine for dogs with average and short coat lengths, but if your dog has long or thick hair you'll likely need the longer contact points, which are available for purchase separately. Proprietary Battery: This small collar has a lot of perks, but it doesn't feature a rechargeable battery. Instead the collar has a proprietary PetSafe battery. The battery lasts about 100 days. Compatible With Other PetSafe Collars: One of the nicest features of the PetSafe systems is the compatibility that makes them suitable for households with dogs of different sizes. You can install this PetSafe Elite Little Dog PRO-Grade system using the included receiver collar for your small breed and add a PetSafe Deluxe Receiver Collar or PetSafe Stubborn Collar for your medium or large breed. Since the correction levels are controlled individually you can personalize the correction strength for each dog. 25 Acre Capacity: The Elite Little Dog PRO-GRade system is capable of powering up to 25 acres of containment area. In this upgraded kit we include 500 ft. of pro-grade, heavy duty 14-gauge dog fence wire and 50 ft. of pro-grade twisted wire to get you going. The included upgraded wire is enough for about a 1/3 acre installation. Adjustable Boundary Zone Width: The width of the boundary zone is generally set at 3-5 ft for most installations but the Elite Little Dog system does allow the user to choose the boundary width. You can set the boundary at anything from a few inches to 10 ft. depending on your dog's likelihood to try to run through and the amount of space you have to play with inside the boundary line. • PetSafe 3-Volt Battery (RFA-188) -The average life of this battery is 1-2 months. 1 Year + Limited Lifetime: A 1 year full warranty on the system followed by a lifetime of fixed rate repairs. The cost of the repairs depends on the nature of the problem. This dog fence is great investment. This dog fence is a great investment. Once I installed this system and trained my little Yorkie, I knew I had found a great way to keep my dog in the yard. I recently moved to a new house and did not want to have a fence around it. After a little research I found an alternative. The solution was a dog fence. This dog fence has met all of my expectations. I would recommend this dog fence to my friends and family. The collar that came with the elite little dog fence fit my pet perfectly. I was worried that the collar would be to big for my Yorkie. Everything about this dog fence was a perfect match for my small dog. Thank you FlexPetz. I have a rambunctious toy fox terrier. Our daily walks were not enough to tire him out. I have several neighbors who have invisible fences for their dogs. Their dogs are quite a bit larger than Skipper, I was worried that the collars would be too big for him. I did some research and found this fence. The collar is really small! I was glad to see it was made for small dogs. I did ask my Veterinarian about it, just to be safe. She said the fence was ideal for him and wouldn't cause him any issues. Although I don’t know much about dogs or fencing for that matter I had to know what all the fuss was about. My mother my aunt and my grandmother all bought products from flexpetz and they all loved them so I had to give it a try. The little dog fence was more valuable I expected it would be and I am glad to have gotten this word of advice because I now enjoy the same comfort that my family has for some time now and it suits my dog very well. Thank you Flex petz for giving me the same quality and service that you have given my family and countless others. 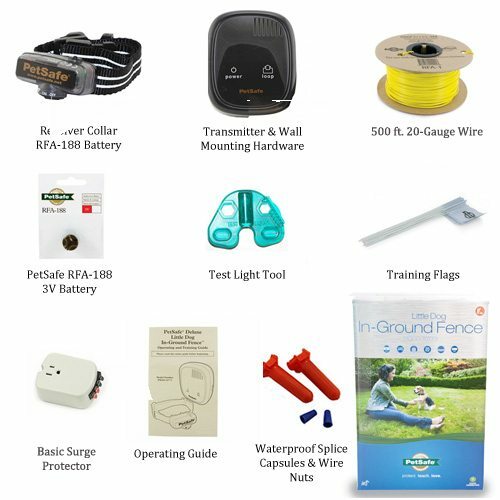 Before I found out about this site I did not know that dog fences came with this many options, I was on my way to buying a wired dog fence but it was too much money. My dog is very small and I just thought it would not be worth all that money just to keep my little dog in my yard so of course I was happy to find out that I could get something just for small dogs. I ended up liking the little dog fence so much that I got another dog and the indoor fence too for the price I would have paid for 1 wired fence and installation. How's that for a deal. The first in-ground fence I bought was not made for my dogs type which is small. The collar was too big and the whole thing just seemed as though it was causing my dog pain. I could not bare to see him in such discomfort. Needless to say I returned it and im sad to say that it was not soon enough. I continued to look at my options. Somehow I ended up on Flex petz.com. I searched throughout their site to see if I could find something to fit my needs. I was very surprised to know that I had found exactly what I was looking for and it turned out to be an even better fit than I ever thought I could find. The collar is fit for my dogs size and it’s lightweight so I can be happily sound knowing that my dog was in no way hindered by the collar. It also has five correction levels and a tone only mode so I know my dog is not being harmed in any way by extreme shocks. I am completely satisfied with everything except for the non rechargeable battery. I have to buy extras for 10 dollars each time they die out. It can be somewhat irritating to have to keep paying for more but I have found that buying them in bulk helps alleviate that issue. overall it’s great for those of us who have smaller pets. I give them an A+ and would recommend this dog fence system to anyone with a small dog. I love the little dog fence! I can only think of one problem this fence has and it is not how the system works but the fact that the the batteries are not rechatgeable and I now have to purchase more and although I hate having to buy extra, I do like this system and it’s capabiliteis. I was wanting an in ground fence for my small dog Sifen but no matter where I went they were all very high priced and did not support dogs as small as Sifen. I was about to throw in the towel and just accept the fact that I would have to pay an even higher price for installation of a standard metal wire fence. Well long story short, FlexPetz.com saved the day! I have a friend named Mark. He has several dogs he likes to breed & sell. I was getting a puppy from him for my son on his 7th birthday he has been asking for one for a while now. I seen how well he was able to train and keep control of so many dogs at once. So I asked him how he was able to do this? He told me about an invisible fencing system & how great it has been for him to keep them under control. He told me if I was interested check out www.flexpetz.com so I did. I found the perfect product for our new puppy & I love this product. Its has been a great training system. It is also easy to set up, fully portable and very affordable. I am amazed with how well this product works I never have to worry about the safety of our new pup (my son named him) Stampy. I think its cool that I don’t have to spend any extra money trying to build & set up an actual fence. Would have cost me way more than I spent & I saved nearly $1000. What isn’t great about that?